One of the most sought after topics on our website involves foreclosures in Tallahassee and how the impact of distressed properties for sale in Tallahassee is impacting our housing market. 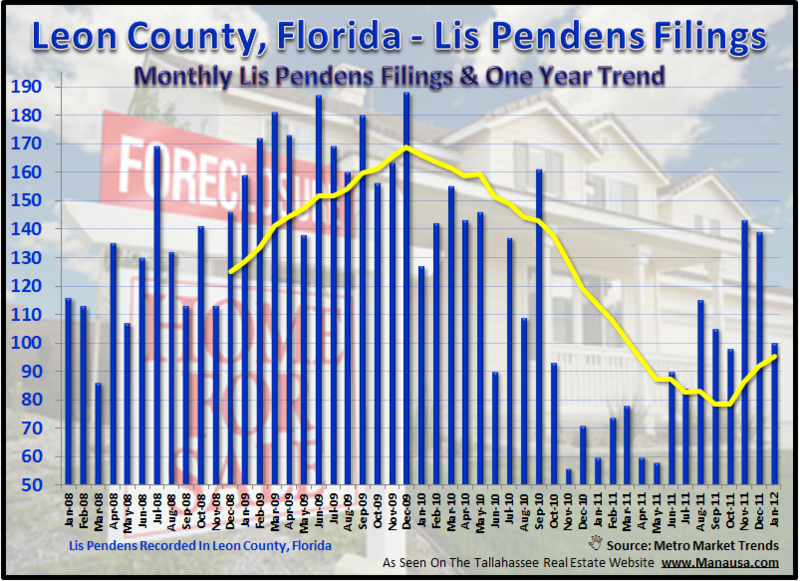 While long-time readers of the Tallahassee Real Estate Blog know that they can always find timely updates on lis pendens filings and foreclosures in Tallahassee (by clicking on the "Foreclosures" tab in our navigation bar), I also like to emphasize significant trend changes as they occur. Every foreclosure sale that has occurred began first as a lis pendens filing. Lis pendens is Latin for “suit pending.” This may refer to any pending lawsuit, though it is most often a sign that the foreclosure process has begun on a property. The graph at the upper right shows that new lis pendens are on the rise, which means we should prepare for the number of foreclosure listings (supply) to increase in the coming months. If you notice the significant decline in filings that occurred just over a year ago, then you will get a glimpse of the robo-signing scandal's impact on distressed properties in Tallahassee. 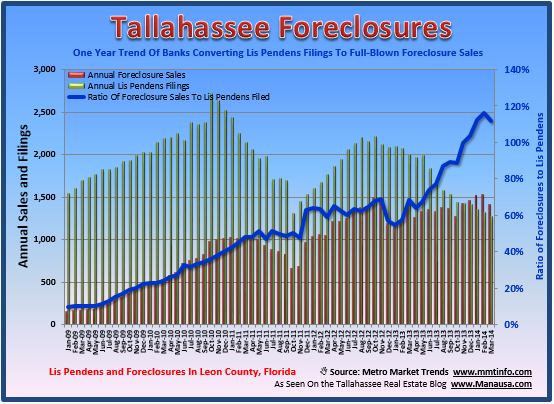 Now that it is behind us, we should brace for a rush of foreclosures in Tallahassee. Just as the rise of lis pendens filings has re-emerged, so too has the acceleration of foreclosure sales. The following graph shows that the number of Tallahassee foreclosures has risen for three consecutive months, and January foreclosures rose a whopping 208% over January 2011. The following reports have been updated on our Tallahassee Foreclosures page. You can tune in every month for weekly, monthly, quarterly, and annual reports on foreclosure activity in the Tallahassee real estate market. I hope our different resources for distressed properties and Tallahassee foreclosures is helpful. We would love the opportunity to earn your business, whether buying or selling a home in Tallahassee. If there is something specific that I can answer about foreclosures in Tallahassee, just drop me a note and I will endeavor to respond as swiftly as possible.